As a crime writer I tend to read a lot of crime fiction by other authors. So I regularly try and discipline myself to reading other novelists in different genres. One of my favourites is Douglas Kennedy. I was recommended to his book several years ago as a male author who can write effectively in a female voice. One of the first books that I read by Kennedy was The Big Picture which is an enthralling almost epic read. I recently read The Heat of Betrayal and was reminded that Kennedy has a great talent to use a broad expansive canvas to paint a great narrative. The central character of the book, Robin, heads for Morocco with her husband in the hope that they can rekindle their relationship and she can finally become pregnant. When her husband disappears mysteriously, and she becomes the suspect in his disappearance she finds herself on the run and the book takes us on an adventure across Morocco. The descriptions of Morocco and the building of the back story of Robin and her husband Paul are expertly done. I immediately empathised with Robin and her plight and the book hooked me from the first few pages. The desire to solve the mystery drives the whole plot forward and the various twists and turns and the additional characters that are introduced only enhance the plot and deepen the characters motives and our understanding of them. It may not be as dramatic as The Big Picture, but I really enjoyed it nevertheless. Another Douglas Kennedy book that I enjoyed was The Moment with its setting in Cold War Berlin and having been to Berlin earlier this year, where my daughter lives, reminded me that I need to revisit Douglas Kennedy. 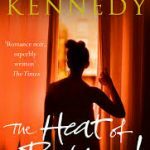 So if you’re dedicated crime fiction fan and can’t drag yourself away from thrillers and mysteries I would certainly recommend reading one of Kennedy’s books.